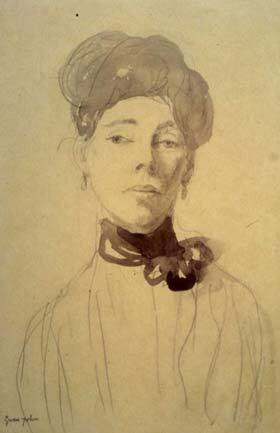 This Woman’s Work explores the work of female artists in the Swindon Collection. The exhibition aims to explore the changing status of women artists within Swindon’s collection, showing the growing prominence of female artists within modern British art and to celebrate a selection of important and engaging works. Artists in the exhibition include paintings and drawings by Gwen John, Mary Fedden, Gillian Ayres, Nicola Tyson and Sylvia Gosse. Many museums and galleries are considering how they can better reflect female artists in their collections and further represent women’s contribution to the art world now and in the past. Here in Swindon, we are starting this discussion by celebrating some of our favourite works by women artists in our collection. Some may be familiar to regular visitors to the museum, whereas others much less so, despite having been part of the collection for many years. Swindon’s Modern Art Collection was established as ‘a modern collection for a modern town, which echoes the society and culture of a modern world’. This exhibition seeks to celebrate the significant contribution of modern female artists within this context. This Woman’s Work runs till Saturday 16 March. Historically, there have been significant barriers to women becoming professional artists. Women had to work within the studio of a male guardian or relative. Women could not attend art schools. Women were not able to easily travel to sell their work or seek commissions. There were also doubts as to whether women had the intellectual capacity to create truly great works of art. Going back to the 16th century, some women did work as artists, overcoming prejudice and setbacks to create and sell drawings and paintings. Women joined the Royal Academy in the 17th century (although they were forbidden from attending life drawing classes). Women exhibited in the first Impressionist exhibitions and served as Official War Artists. The Swindon Collection has over 500 paintings, drawings, prints and sculpture. Of these, around 17% were produced by female artists. Underrepresented in the collection since its inception in the 1940s, Swindon did not acquire many works of art by female artists in its early years, and it did not often exhibit works by female artists within its collection. In 1945, local benefactor HJP Bomford made a gift of modern British art works that still form the core of Swindon’s collection. In total, Bomford gave Swindon twenty two works of art, but only one (Composition, by Mary Kessel) was by a female artist. Frederick Phelps gave Swindon twelve paintings and again, only one was by a female artist. A further twenty one pictures were purchased using the bequest Phelps left, but none by female artists. There were many significant female artists working in the British art scene in the early 20th century who were never acquired for the Swindon Collection, including Barbara Hepworth, Dora Carrington, Eileen Agar, Dame Laura Knight, ‘Gluck’ and Evelyn Dunbar. Through the support of organisations like the Art Fund and Contemporary Art Society, Swindon has since acquired significant works by Gillian Ayres, Mary Potter, Gwen John, Vanessa Bell and Mary Fedden.